I looked the word inspiration up in my beloved hardback, my yellowed and aged thesaurus. Just by reading the string of inspirational words in print, my mind went into picture painting mode. Inspiration is the springboard for creativity. Inspiration facilitates progress toward goals. 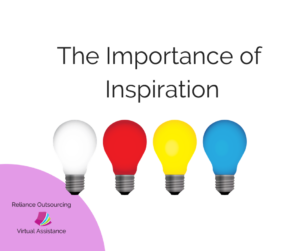 Inspiration is incredibly important to us as people, as business owners, or in any role that is part of our walk in life. Without inspiration we fall short of growth. We forget to connect to our value system. We lose creativity. We stop settings goals — we do not feel driven to meet goals that we’ve already set. So, how do we seek inspiration? We know when we’ve become inspired. We recognize that stirred up or awakening moment. But, if we don’t feel motivated, how do we find it? It is difficult to find or recognize positive inspiration when you are in the middle of beating yourself up. Step away, take a break, and do something different. Go somewhere — get into a different environment. Take a walk. Take a drive in the car. Go to a movie. Dig in the garden. Just go somewhere other than the place where you were frustrated and looking for inspiration! Sometimes it feels impossible to piece it all together. This is especially true when we are trying to reach our end goals and feel as if we cannot connect the dots to get there. Remember this, we can look at where we have been, and connect our path from there to the present, but we cannot connect the dots to where we are going because we aren’t there yet. If you feel lost or confused, with the feeling that you cannot make sense out of where you are going, it is okay. It is okay to shift gears. To is okay to rewrite action steps that move you towards your goals. So, whatever your stuck point is. Don’t sweat it. As long as you keep moving forward, even if moving forward includes taking a break, or taking in music, art, gardening, or a nap, inspiration will return.